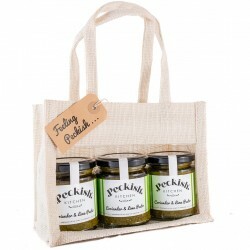 A unique range of delicious artisan pesto, chutneys and preserves. 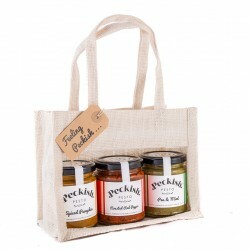 Peckish Kitchen are a family run business who create delicious vegetarian and vegan pestos and preserves in the heart of Yorkshire. They handcraft all their products in small batches and pride themselves on only using quality natural ingredients, with no artificial colours or flavourings. Taking part in the newly thriving artisan revolution, they strive to be distinctive in their recipes, so have created a range with flavours which are exciting and different. From boozy preserves to pestos which put a Yorkshire take on an Italian classic, they have something for everyone. They aim to locally source their ingredients where possible and purchase their labels, jars and packaging from Yorkshire based companies. In an effort to be environmentally conscious they offer biodegradable bags and re-use packing material for postal orders. 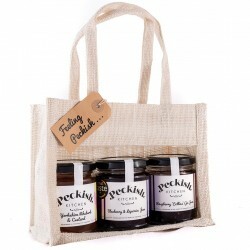 Peckish Kitchen have won numerous awards including Great Taste Awards for their Roasted Garlic Pickle and their Blueberry & Liquorice Jam, and a Silver Award in the World’s Original Marmalade Awards Dalemain 2018 for their Orange & Boozy Bitters Marmalade.